Although representing less than 1% of the total amount of water on Earth, the freshwater is essential for terrestrial life and human needs. Despite the existing in-situ gauging networks represent a tool for quantifying the instantaneous water volume in many river channels, we have surprisingly poor knowledge of the spatial and temporal dynamics of surface river discharge. Developing new procedures for river discharge estimation based on satellite remote sensing technology becomes mandatory and urgent. 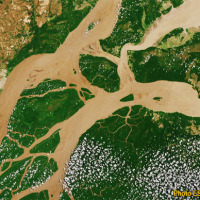 In the last twenty years, it has been demonstrated that satellites can be used for monitoring river discharge in a profitable way. RIDESAT project has the purpose to develop a new methodology for the joint exploitation of three sensors (altimeter, optical and thermal) for river flow monitoring and discharge estimation. The intention is: 1) to better understand the use of optical and thermal sensors through the study of the physical meaning behind the process and their field of applicability; 2) to develop a procedure of merging the three different satellite data through a physically based method that uses hydraulic variables obtained by satellites (e.g. water height, slope, width, flow velocity).